The RR Type 2 Inverter is the smallest model in the range and offers floor level access for loads of up to 1000 Kgs in weight and 1400mm in height. It clamps and reclines under hydraulic power and revolves easily by hand. Like its bigger brother, the RR Type 2 also works on a recline and rotate principle to achieve 180 degree inversion. The dual clamping and tipping are hydraulically driven whilst the turning is achieved by releasing a lock mechanism and rotating the body by hand. It is a smooth, simple and quick operation. 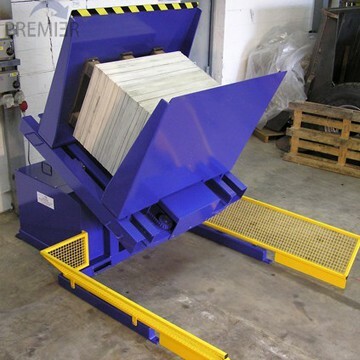 The Type 2 is usually rated at 1000 kgs capacity and is designed to handle short stacks of product, particularly paper. 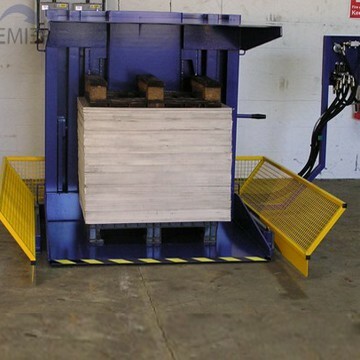 It is used to turn piles through 180 degrees for reverse side printing or by papermakers to transfer 2 small piles of paper to one larger pallet for distribution. 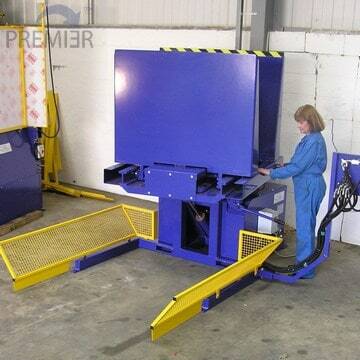 The loading table is flush to the floor for ease of loading by pallet truck. Controls can be either lever operated or extended push button. Above all the RR Type 2 is an extremely compact system which will work in the minimum of floor space and headroom, making it particularly suitable to small print shops. The whole inversion operation takes less than a minute per pallet so it is fast as well as simple.